Fall 2018 shows began with the Mattoon Street Arts Festival on September 8 & 9 http://mattoonfestival.org/. We will be showing at the Reeds Landing Artisan Craft Fair on Saturday, October 27, 10 a.m. to 3 p.m., 807 Wilbraham Rd., Springfield. Our last show of the fall will be the holiday craft fair at South Congregational Church on Sunday, November 11, 11 a.m. to 2 p.m., 45 Maple St., Springfield. 20% of sales at that show will be donated to the church’s food and clothing ministries. Our first show of 2018 was the South Hadley CraftFest, Saturday, April 21, 9:30 a.m. to 3:00 p.m. in the Plains School Gymnasium, 267 Granby Rd. and 00 Lyman St. in South Hadley, MA. It was a lovely show with great vendors and music, and we hope to be back next year. Fall 2017 was busy, beginning with the Mattoon Street Arts Festival in September, where we won First Prize in Jewelry for the fifth time! http://mattoonfestival.org/ On October 28 we were at the Reed’s Landing craft show and in November we once again took part in a craft fair at South Congregational Church to benefit the Deacons’ Fund. We finished the holiday show season in December by participating in a show at David Hillerby’s photography studio https://m.facebook.com/David-Hillerby-Photography-161606567525332/ in the Baustein Building, a newly re-purposed industrial space in Holyoke occupied by artists and galleries. Thanks to all who turned out to support these shows! On Saturday, December 3, 2016 we had a booth at the Stone Soup Bazaar sponsored by the Amherst Unitarian Meeting House. We were very pleased to be part of a town-wide sales event, emphasizing locally created artisan goods. On November 13, 2016 we took part in a show to benefit the Deacons Fund at South Congregational Church in Springfield, MA. 20% of sales was donated to assist members in need. Once again we had a booth at the Mattoon Arts Festival, September 10 & 11, 2016 and we plan to return in 2017. We look forward to seeing our regular customers there. Thanks for your continued patronage! We had a great time at the 2016 Asparagus Festival! 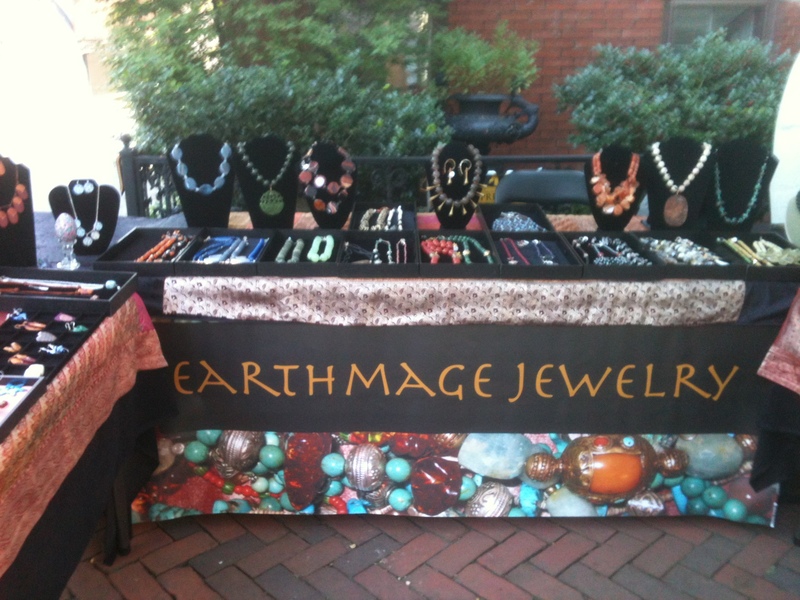 We are very pleased to announce that EarthMage Jewelry was awarded First Prize in Jewelry at the 2015 Mattoon Arts Festival! This is our fourth first-place win there!! The annual Mattoon Arts Festival has about one hundred vendors in jewelry, fiber arts, pottery, art glass, woodworking, photography, etc., plus live music all day and great food. Thanks to all who have come out to see us there!